Wedding season is just around the corner, so it's highly likely that your WhatsApp group chats are now dominated with dress-related questions and advice. Wedding-guest outfits can require a lot of planning, so not only are we helping by trying on as many dresses as we can, but we've also asked some of our fashion friends what they plan on wearing to weddings this year. Influencer Monikh is so prepared for wedding season that when we asked her for links to her outfit, she sent us a picture of her wearing it already. For the weddings she's planning on attending this year, she'll wear a sheer puffy-sleeved dress from Shrimps with a pair of red strappy sandals with a crystal hair clip by Rosantica. That's not the only exquisite dress that was sent to my email inbox. Ellie from Slip Into Style opted for a bright-pink satin dress by Nanushka, which will work for almost any venue and style of wedding. Accessories can require just as much thought, and the wish lists below include the most amazing crystal hairclip, a pair of all-day sandals from By Far and a shell necklace that everyone will be complimenting you on. Keep scrolling to see and shop the fashion-forward wedding looks. 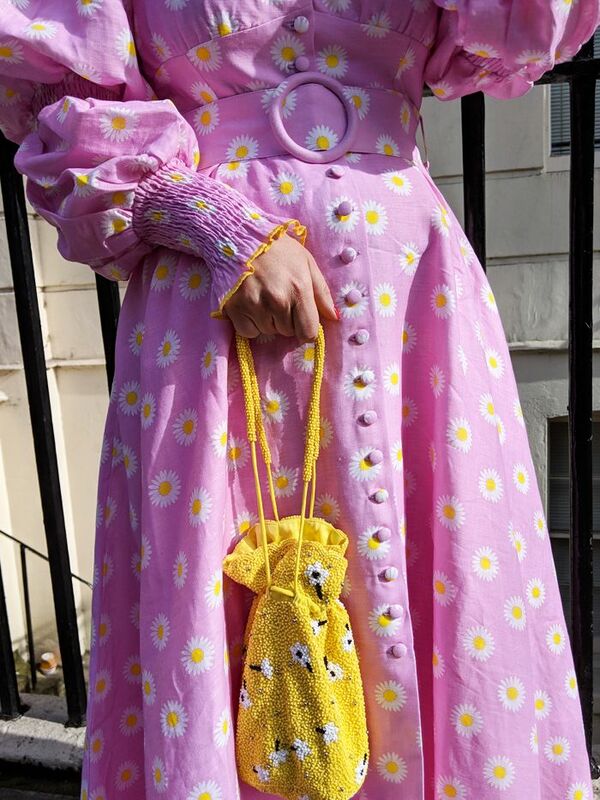 Elizabeth von der Goltz, Global Buying Director at Net-a-Porter, opted for a classic polka dot dress by Alessandra Rich, and then experiments more with the accessories with a Gu De PVC mini bag, white leather mules and an oversized raffia hat. 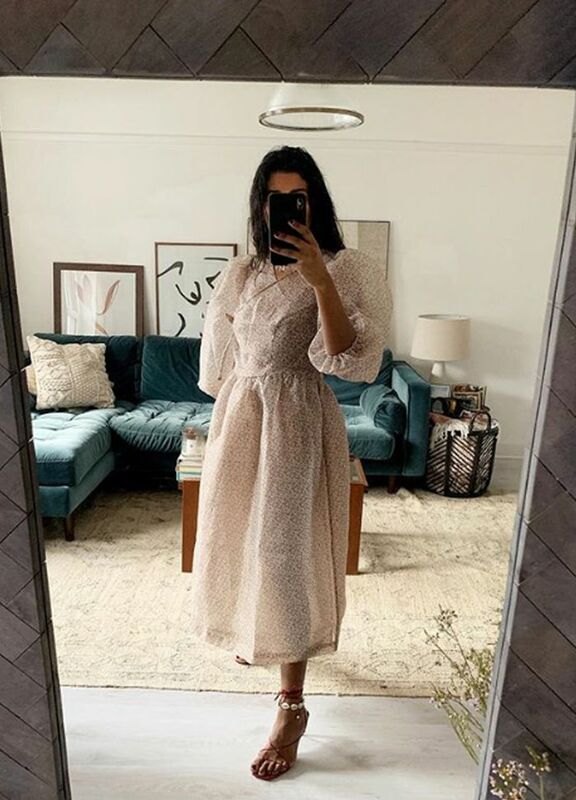 Influencer Monikh has found one of the prettiest dresses out there: a sheer Shrimps dress with dramatic sleeves. Ellie from Slip Into Style loves this pink satin sleeveless midi dress from Nanushka, which she wears with pearl earrings and gold strappy sandals from By Far. Rixo dresses are perfect for weddings, and Loanne plans on wearing the powder-blue daisy-print Monet dress with a shell necklace and white mules. Black is a colour many still avoid for weddings, but Jordan shows that one way to do it right is to opt for a dark floral print with black accessories. Alexis opted for an edgier wedding-guest look, selecting a sand-coloured fishnet dress with a handkerchief hem by By Malene Birger. We love how she paired it with sculptural accessories by Staud and Rejina Pyo. Who What Wear's US Editor-in-Chief Kat Collings plans on wearing Rotate's metallic midi with a knot on the waist, with a pink headband and lilac sandals. This inspired me to do my own fantasy wedding-guest outfit too. I tried on the below Olivia Rubin dress for a We Try Before You Buy and haven't been able to stop thinking of it ever since.